While I was traveling the Silk Road, one of the countries that surprised me the most was Kyrgyzstan. Central Asia is not exactly one of the most popular destinations, and Kyrgyzstan is, for most people, just one of those far away “-stan” countries. However, it has so much to offer! 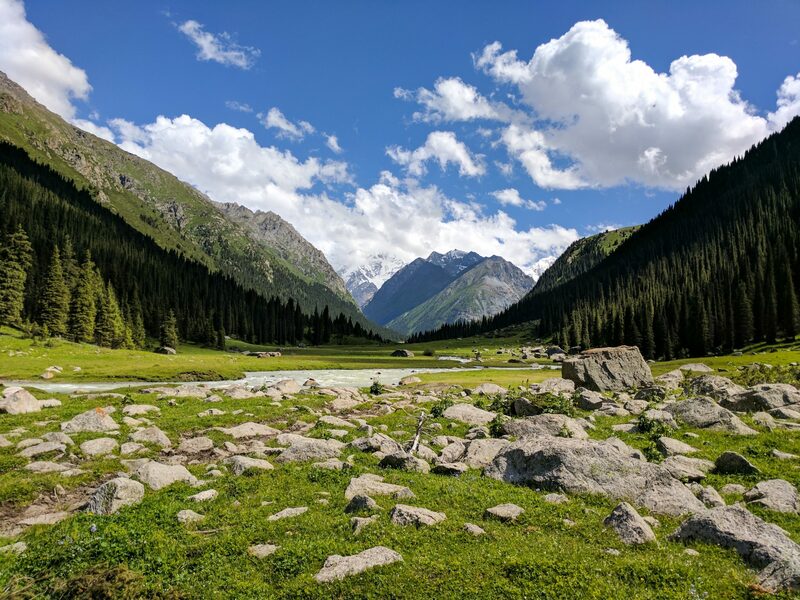 From its incredible natural beauty to the fascinating culture of the Kyrgyz people, these are the reasons why Kyrgyzstan should be next on your bucket list. Everybody has a different reason for traveling, but, for me, one of the most important ones is discovering new cultures. And the nomadic people from the Central Asian steppes is one of the most fascinating ones, as I covered in my People in Central Asia photo story. Kyrgyz people are, of course, famous for the Yurts. This portable tents can be built and packed in just a matter of hours, and are perfect for the nomadic lifestyle. Inside there usually is a small coal or wood furnace to keep it warm and colorful decoration. One of the coolest experiences to have in the country is sleeping in one of them. While it might be very cold inside in high altitude, a good amount of blankets is usually all you need to spend a comfortable night in a cozy yurt! Yurts aside, there are plenty of fascinating aspects of the Kyrgyz culture. Food is, of course, one of the most important aspects of a culture, and Kyrgyzstan is not short on it! Plov, the mix of rice with boiled meat and vegetables is everywhere in Central Asia. The meat shashliks (smoked kebabs of meat, usually mutton) are amazing, as well as the different types of fried bread. One of my favorites where the manty, steamed dumplings filled with meat and onions. Drinks can also be very interesting. So be prepared to try Kymyz, made with fermented horse milk, or Bozo, a winter drink made with fermented millet. However, nothing is such an integral part of the Kyrgyz culture as the horses. In the Central Asian steppes, the horse is venerated by all cultures, from Mongols to Turkmens. The culture of Kyrgyzstan rotates around these animals in many, many ways. One of the most shocking ones is the (now illegal) practice of ala kachuu or bride kidnapping. Traditionally, two families that are very close will arrange a wedding between their children, sometimes before they are born. However, there was another way. Two people that are in love can agree on performing an interesting stunt, where the groom kidnaps the bride (with her consent). This was especially useful when the parents of the bride were against the wedding since they will be forced to accept it. Sadly, today a lot of women are forcefully kidnapped, and some people still do that despite being illegal. It was, however, extremely popular in the past, to the point where in 2015, where it was outlawed, 40% of married women said that they were kidnapped by their partners, and only two-thirds of them were consensual. The biggest surprise for me when I traveled to Kyrgyzstan was, without a doubt, the natural beauty it has. I must confess I probably didn’t do my homework when it comes to research the country before I went there, but in my defense, I like to be surprised, so I usually try to avoid spoiling myself too much from the places I travel to. Once I was there, looking at the incredible landscapes and deep valleys I couldn’t do anything but admire the country in awe. 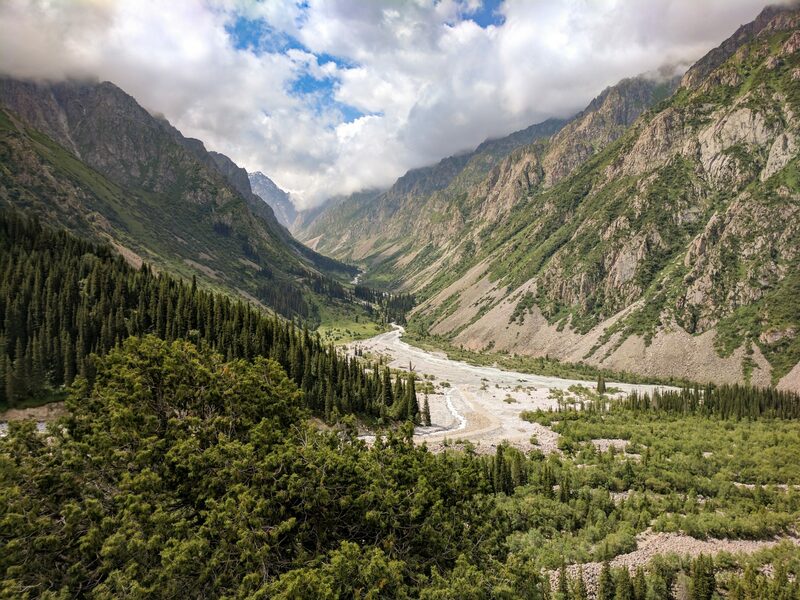 I always associated Central Asia to deserts and rocky mountains, and I never expected the lush, green fertile mountains and plains that cover Kyrgyzstan. No matter where you go in the country the background is always amazing. From the beautiful peaks of Ala Archa to the stunning mountains of Altyn Arashan or the blue waters of the Song Kol lake. 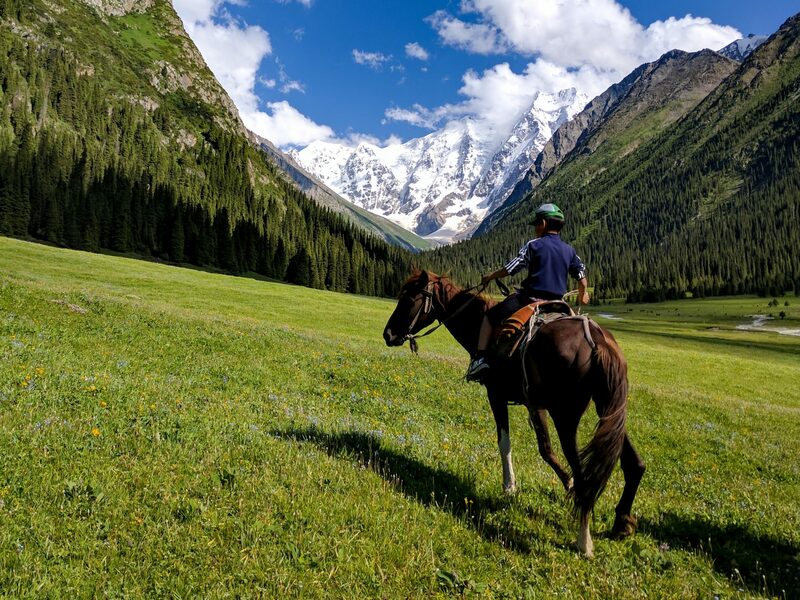 Kyrgyzstan has plenty to offer to any lover of beauty and nature. Bishkek is the capital of Kyrgyzstan, and probably the best place to start a trip around the country. It is a big, modern city, very different from the rest of the country. The contrast between the nomadic people from the mountains and the ones from the city is very interesting. Here you can find all the amenities you would expect from a city. You will have to move mainly by taxi since public transport is not the best. However, there are a few buses, vans and trolleybuses going here and there. Bishkek is a very good place to book the rest of your trip in the country. CBT (Community Based Tourism Association) it’s probably the best way to do it. They are pretty much the only option. The good thing is that they try to connect local people and improve the living conditions of the Kyrgyz. So it’s pretty cool. 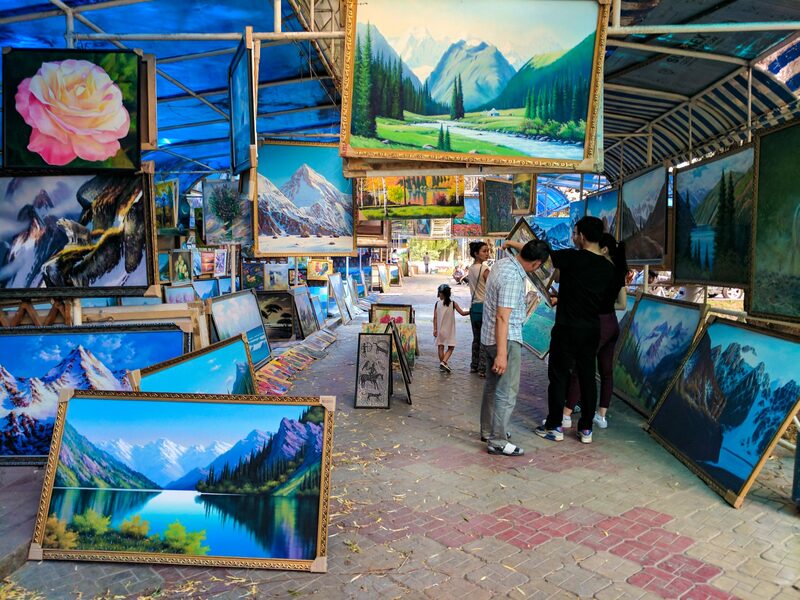 Once you have your itinerary sorted out, go out an explore Bishkek! 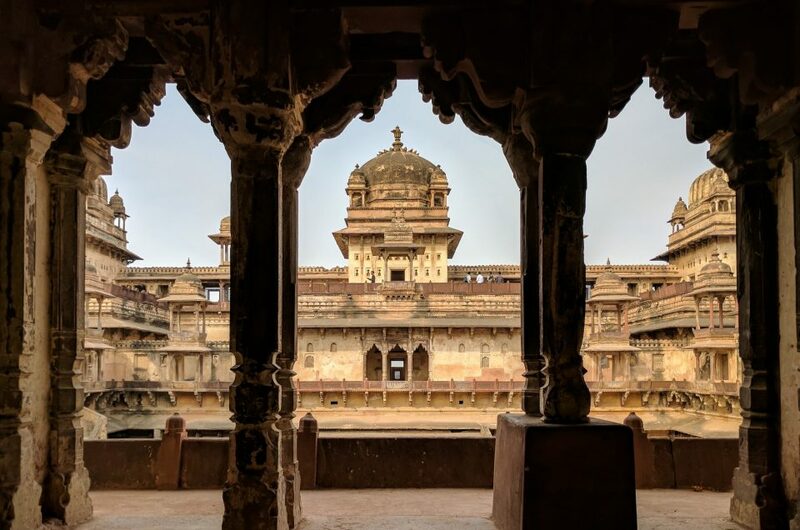 While it doesn’t have the monuments and historic buildings that you might find in other places, it has a lot to offer. The city center has beautiful corners, like the painting market. And it is the perfect place to try all kinds of food! There are lots of restaurants that are perfect for a first impression of the Central Asian cuisine. Of course, you can find plenty of options, including western style restaurants. But I recommend diving in and trying some of the Kyrgyz food. There is also room for innovation. While I was there some of the people I was traveling with discovered a beautiful cafe opened by someone from New Zealand that we all loved! If you still find your time in Bishkek boring you can try doing one of the many day-trips offered there. Ala Archa, the National Park I mentioned before, it’s not far from the city, so going there and staying overnight is an option. Or maybe just a quick visit! It´s up to you. When I stayed there I did exactly that, and since I had some extra time I went rafting to the Chu river. It was freezing cold but it was very funny! And a good way of doing something different that day. If you go to Kyrgyzstan you can’t miss Kok-Boru. 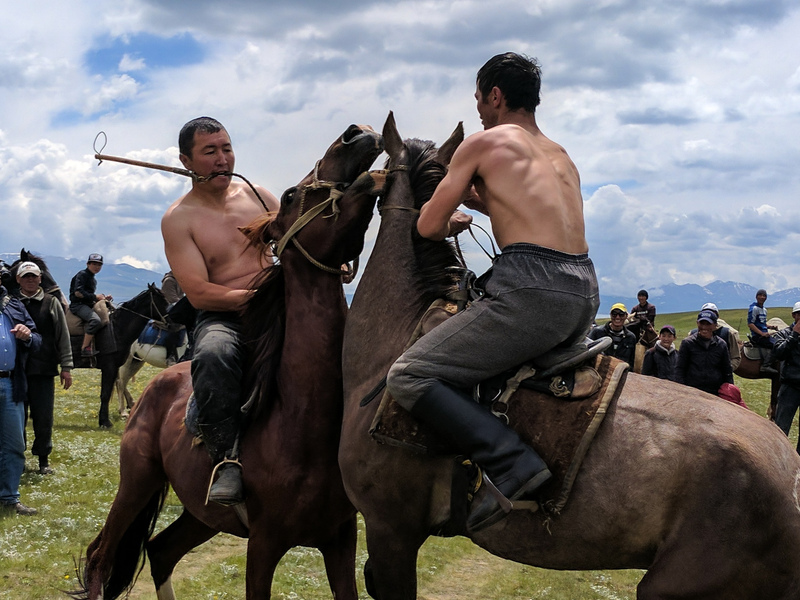 This fascinating sport played all over Central Asia is both fascinating and brutal. The game is somewhat similar to polo. The objective is to score in one of the goals in each size of a field. However, the significant difference is that instead of a ball, the game is played with the carcass of a goat. 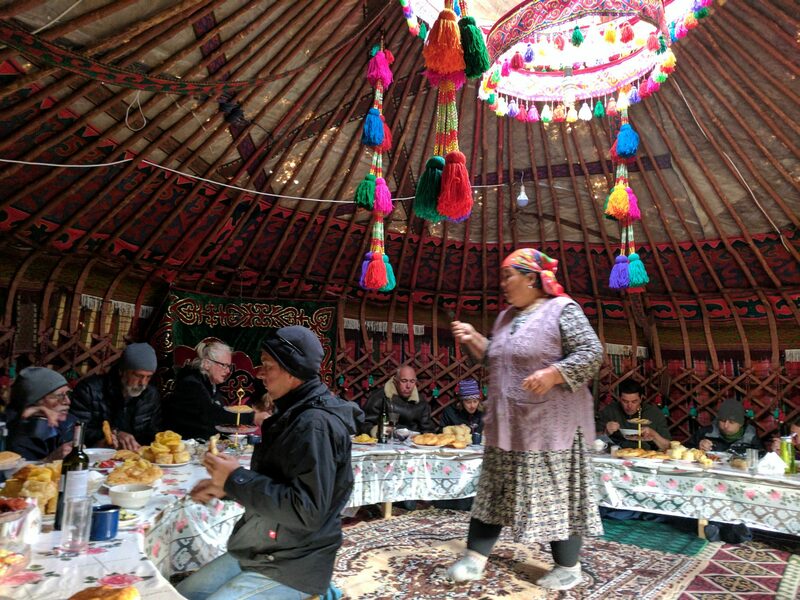 I had the chance to witness a game of Kok-Boru while I was staying in a small yurt near the Song Kol lake, and it was outstanding. To decide who starts the game two members of both teams have to fight, throwing the other off their horse. Of course, this is just training for the real game, where brutal encounters between high-speed horsemen will happen constantly. It’s a cultural experience on its own and a very different sport to what I was used to. I mentioned before how Kyrgyzstan has amazing landscapes. And this is perfect for outdoor activities! If you like hiking, trekking, skiing, climbing or horse riding this is where you should go. There are plenty of trails for all kind of hikers, from beginners to more advanced. 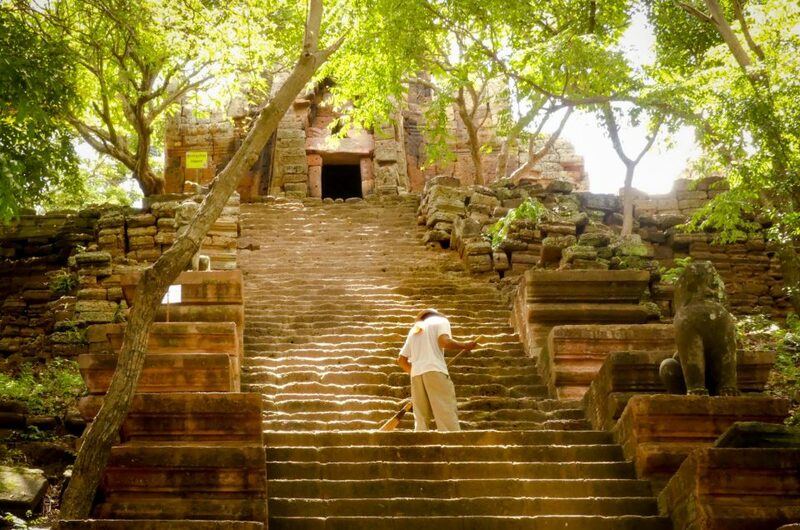 The country offers a pretty good variety of landscapes even in a relatively small area, so you will not get bored. While I’m not a climber myself I’ve heard that it’s also the perfect country for beginner mountaineers. There is a huge variety on the altitude of the mountains of Kyrgyzstan, from the easy 3,000 meter ones until well over 7,000. Hiking is also a fantastic option. 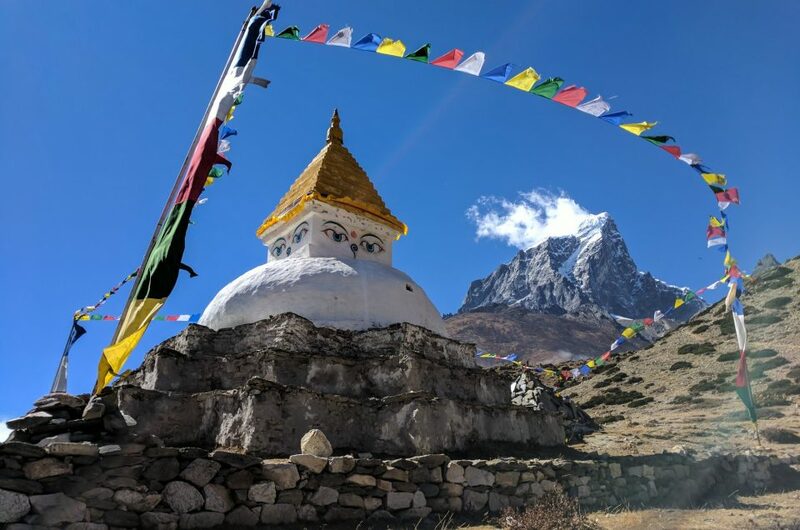 There are all sort of trails, especially in National Parks like Ala Archa, where there is even accommodation for hikers to stay overnight if you don´t want to carry a tent with you. Just remember to be very careful, the weather can change very quickly! What was a sunny and peacefully valley can suddenly become cold and rainy. It’s hard to get your head around it where just by driving for a while the scorched desert can transform into a cold glacier. However, the main activity you should definitely do is, of course, horse riding! Horse riding is, after all, the soul of the whole region. Don’t worry if you have never done it before, that was my case and it ended up being extremely good! I even got confident enough to make my horse gallop for a few seconds by the end of my second ride! I hope after all this I managed to spark your interest in this beautiful country! Kyrgyzstan was one of my biggest surprises as a traveler. An unexpected underdog in my mental list of countries that happened to charm me. Remember that not only it´s a fantastic place to visit, you will also get a lot of value for the money. After all, it’s not an expensive country, especially compared with most popular destinations. 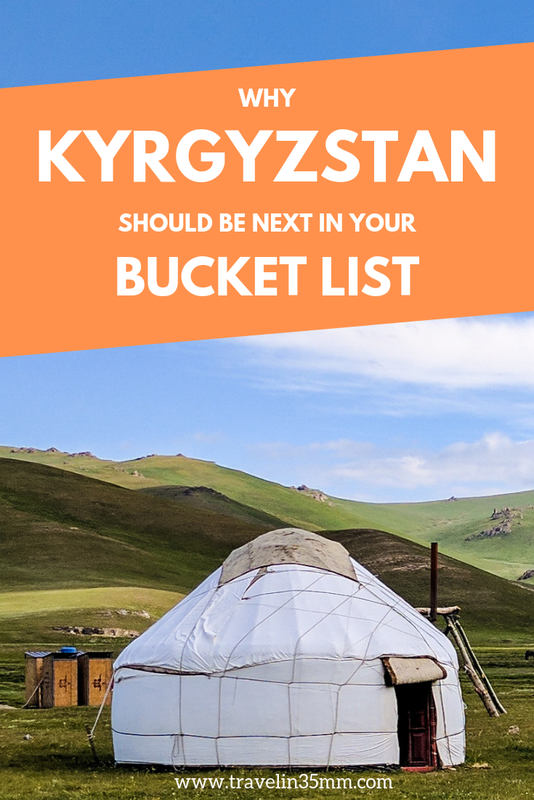 So remember, if you like discovering new cultures, exploring amazing places and trying new food Kyrgyzstan should be the next country on your bucket list! Don’t forget to pin it if you liked it! Sign up to receive notifications of new content by email!